I like Stephen Soderbergh as a filmmaker because of his unpredictability. He makes films that obviously are personal projects because they’re the kind of movies that leave me scratching my head after I’ve seen them. I’m talking about movies like “Full Frontal” “Erin Brockovich” and “The Girlfriend Experience” Then he turns around and directs first rate, sitting-on-the-edge-of-my-seat crime thrillers like “Out of Sight” and “The Limey” Then there are movies like “Kafka” and “Bubble” which are difficult to describe or explain and really should be seen without any idea of what they’re about. And Soderbergh proved with “Ocean’s 11” “Ocean’s 12” and “Ocean’s 13” that he could do big blockbusters with all-star ensemble casts. Then he up jumps and directs a two-part bio pic “Che” that is nothing less than astounding. So we’re talking about an extraordinary director of talent and range who knows what he’s doing in a variety of genres. So why did CONTAGION feel like I was watching a newbie director desperately trying to figure out what his own movie was about? Beth Emhoff (Gwyneth Paltrow) returns to her Minneapolis home from a business trip to Hong Kong to her husband Mitch (Matt Damon) and son Clark. The happy reunion isn’t happy for very long as Beth dies two days after returning home and Clark dies not long after. Both Mitch and his daughter from a previous marriage appear to be immune to whatever it was that killed Beth and Clark and a good thing for them that they are. The new disease, MEV-1 is both frightening and lethal. 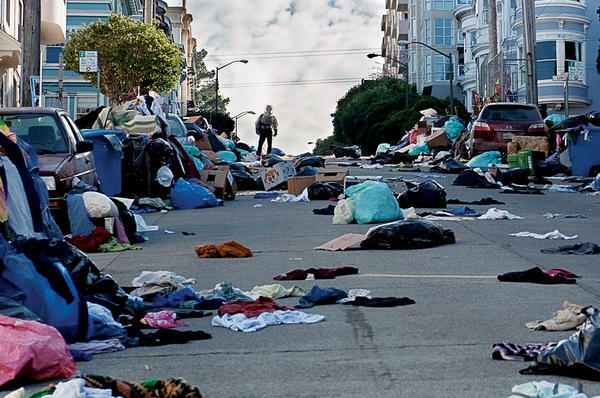 It swiftly spreads across the world and the death toll rises to a staggering level. Nobody can figure out where the disease came from and while more and more people die, Dr. Ellis Cheever (Laurence Fishburn) at the Centers for Disease Control and Prevention in Atlanta, Georgia struggles to find a cure. Assisted by his field agent Dr. Ellen Mears (Kate Winslet) and an independent researcher Dr. Sussman (Elliott Gould), Cheever has to juggle several explosive balls. There’s the Department of Homeland Security who insists that this epidemic must be a bioweapon attack. Video blogger Alan Krumweide (Jude Law) claims that there is a homeopathic cure for MEV-1 that the government is keeping secret. His blogs only add to the breakdown of social order as panicked people flee population centers by the millions while the ones who are left turn on each other, stealing food and water. Entire states are quarantined off by the Army and National Guard in an attempt to minimize the spread of the disease. A disease that looks as if it’s going to wipe out humanity, no matter what. Sounds like a really thrilling movie, don’t it? Sorry to disappoint you but it’s not. I found CONTAGION to be slow moving and downright impersonal in it’s handling of a truly frightening possibility that all the experts say is due to happen any day now. But the characters in CONTAGION seem to accept the possible extinction of the human race with a shrug and an “Oh, well, nothing lasts forever.” Only Jude Law sinks his teeth in and gives his character energy and drive. Alan Krumweide is as low as they come but at least when he’s on the screen he’s interesting and there’s something happening. 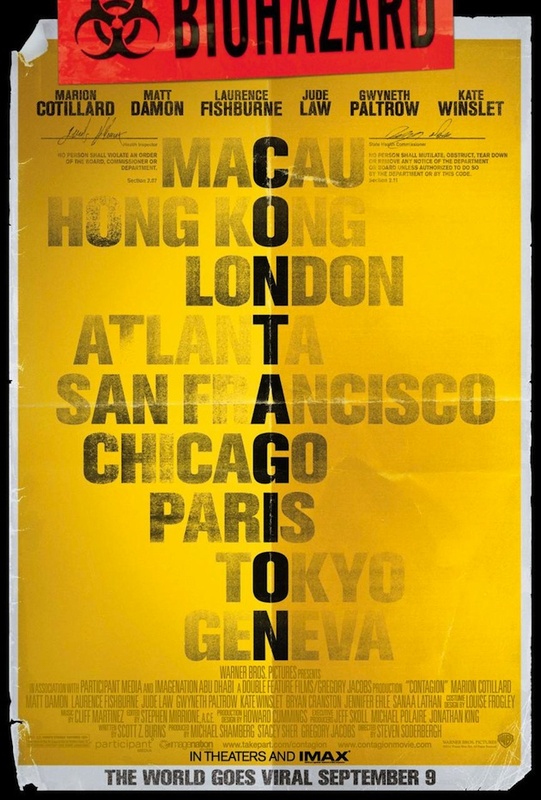 CONTAGION is one of those movies that makes me feel smarter while watching it because even though I don’t understand a word of technospeak (but I do speak fluent technobabble) I just feel smarter listening to the big brains discuss what the virus is and how to combat it. And that’s an aspect of the movie I wanted to see explored in greater detail but it never is. When Dr. Cheever and the other big brains in the movie discuss MEV-1 they talk about it almost as if were an intelligent organism with a plan and purpose. It’s a fascinating idea but it’s never followed up on and instead we get scenes of Matt Damon yelling at his daughter not to open the door for her boyfriend because he might be infected. Never mind that if the boyfriend has survived as long as Matt Damon and his daughter then there’s just as good a chance he’s as immune as they are. Maybe I’ve been corrupted by too many 70’s/80’s disaster movies but there just wasn’t enough running around, screaming and looting. I wanted to see entire cities burning as panicked citizens attempt to cleanse the world with fire and kill the plague. I wanted to see truckloads of dead babies being pitchforked into giant roaring furnaces and cripples in wheelchairs and on crutches throwing themselves from the rooftops of blazing hospitals. It’s comforting to see the various governmental agencies acting in such a cool, logical, professional manner but it doesn’t make for interesting movie watching. So should you see CONTAGION? Sure. It’s not that it’s a bad movie. The performances are adequate and the movie looks good. I just think that the possible end of the world should be told as if it really matters and not just to be taken as inevitability. I actually, like this one. You said that, ” be slow moving and downright impersonal in it’s handling” and you are spot on. I felt like the director was showing us the relentlessness of the virus…almost like a zombie. It will follow you, find you and kill you…eventually. BUT perhaps I am giving the director too much credit.